Our 2016 Guest Instagramming season is still going strong with our next featured market- or should I say markets? For growers, California in general is an envy inducing state with varied climate and terrain that nurtures extended and bountiful seasons. Santa Monica Farmers Markets takes full advantage of the talented California farmers whose offering are diverse and in some cases, highly unique. Personally, I would love to explore the tastes of finger limes, Uzbek melons, green gage plums, honey nut squash, and cherimoya that can be found at the markets. Between the four Santa Monica Farmers Markets, the first being established in 1981, there are 150 farmers that participate year-round. Each market has its own personality, its own flare, and its own distinct feel within the community. The Santa Monica Farmers Markets are more than just weekly events, they are a destinations. Lets all feel like Santa Monica locals for the next two weeks and join them for a trip to the markets via Instagram. Jodi Low: We currently operate four weekly markets in three locations in the City of Santa Monica. First was established in 1981 and followed quickly by the opening of three other weekly markets in 1982, 1991 and 1995. The markets are run by a team of paid City of Santa Monica staff and volunteers. Between the four markets we have over 150 farmers throughout the year. Only California farmers are permitted to participate in the SMFMs. Our participating farmers are always cultivating something new and looking for unique varieties found nowhere else including finger limes, Uzbek melons, green gage plums, honey nut squash, cherimoya, 5 varieties of bananas, taro, turmeric just to name a few. JL: The four SMFMs operate year round and are held in outdoor urban settings. The Wednesday market is held in Downtown Santa Monica adjacent to the Third Street Promenade. 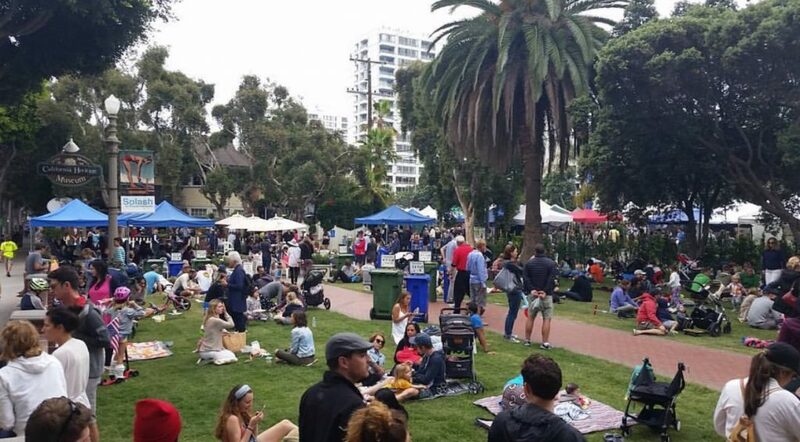 This is a bustling fast paced growers only market and is particularly popular with local chefs and wholesale distributors but is also well attended by people who work or live in the City of Santa Monica. At this market you will find an inspirationally large selection and variety of CA grown produce – over 75 California farmers attend each week. The Saturday market held in Downtown Santa Monica is also adjacent to the Third Street Promenade with a slightly smaller foot print than the Wednesday market, 55 farmers are showcased weekly. The focus of this market is organic growers. Because it’s a weekend market this market is more laid back than the Wednesday market and is visited by tourists as well as local Santa Monica residents and a few chefs and wholesale buyers. The Saturday market held in Virginia Avenue Park has a strong local resident customer base. This market features 35 farmers. Because this market is held in a popular City park with a new library, the vibe is relaxed, casual and community focused. There are a few of prepared and packaged food vendors featured an occasional band and monthly preserving classes. Customers tend to shop, grab coffee, enjoy breakfast with their neighbors and friends and take their kids to the adjacent playground. The Sunday Main Street Market is held in the parking lot of Heritage Square one block from the beach. The property features two Victorian homes (one is a museum and the other is an event space and bar) and a lawn to picnic on. This market showcases 30 farmers, 14 prepared and packaged food vendors, local retailers and crafts, a different band each week, as well as activities for kids such as arts and crafts, face painting and cooking demonstrations. This market has a festive up-beat fun vibe. JL: In addition to the weekly events listed above, we host a variety of seasonal events. All SMFMs accept SNAP, WIC, SFMNP checks. JL: The Wednesday market has the greatest notoriety due to its sheer size, grower only focus, incredible selection and high quality unique produce. This market has a buzz to it, like the night before Christmas feeling you got as a kid. The fact that the farmers themselves come to this market rather than sending an employee sets this market apart from many of the other regional markets. The direct interaction and relationships that are formed here between customers and farmers are heartwarming. JL: After operating for nearly 35 years, our markets have faced many challenges large and small. As the markets have grown and expanded and regulatory and administrative layers have been added, we have done our best to adapt and keep pace. Being understaffed in a sea of possibility is always a challenge – we can be overly passionate and ambition for our staffing limitations. Logistical and tactical operations have changed over the years to increase security and safety of our participants. Understanding our customer base and keeping up with the ever changing trends of the food world can be overwhelming at times. I think one of our biggest successes is creating spaces for our customers to enjoy that feel organic, safe, easy and fun.